We are very pleased to start the new year with a brand new post of handy tips. As we are starting 2017 and carryover is likely a topic on your mind, we have covered off a few related pointers. We hope you enjoy reading them, as much as we enjoy writing them. If an employment profile is configured so that employees are allowed to exceed their allowance, we can also configure ‘Carry Over Debt’ on the employment profile. Therefore if Sally from Sales has 20 days allowance for 2016, but used 24 days, she will be allocated 16 days in 2017, if carry over debt is enabled. Thus subtracting the 4 days from her 2017 allowance. If an employee has TOIL enabled on the employment profile, they can carry over the approved TOIL into the new leave year. Therefore if Trevor from Management has 8 days of unused TOIL in 2016, he can carry over these 8 days into his 2017 allowance. 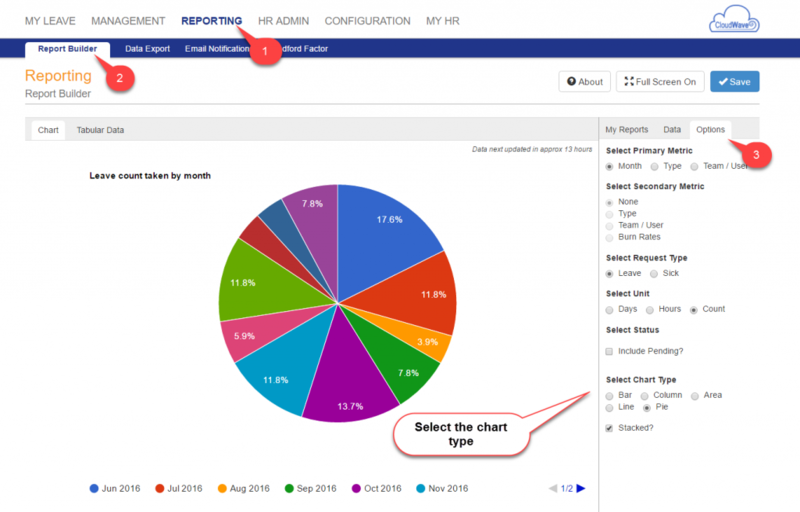 Report information can be displayed in chart format as a visual aid. By default the bar chart is selected but if you want to make reporting a bit more fancy, why not use a pie chart or line chart.